Ramsgate RNLI launched in horrendous conditions on Saturday to rescue a stranded boat. A request for assistance was received by a heavy 20 metre ex Danish trawler adrift in the Traffic Separation Zone midway between France and England. 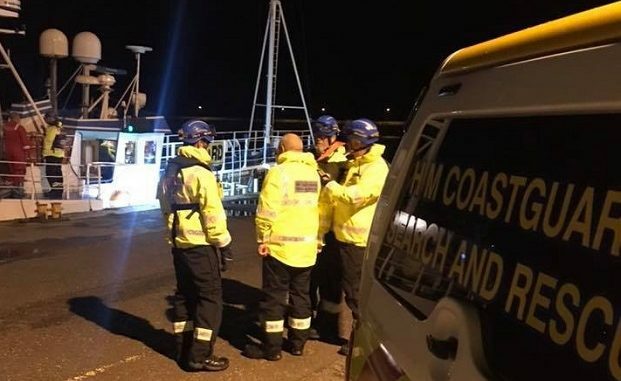 Saturday night was wet and blustery when a PanPan alert was received at 8.04pm by HM UK Coastguard asking for assistance to a guard vessel that was adrift in the shipping lane due to engine problems. A PanPan is not quite as severe as a Mayday but is still an emergency request with no imminent risk to life, however the position of the boat meant that action had to be taken immediately. The all-weather lifeboat was launched within minutes and set off to the guard vessel which was about 15 miles out as the crow flies, however it was a longer journey due to having to skirt round the Goodwin Sands. The vessel had arrived on station the previous day having motored down from Grimsby with its three crew onboard for the start of a three week rota. They were guarding an uncovered portion of the Nemo Link® subsea cable which runs between the formerly occupied Richborough Power Station, and a similar converter station in Herdersbrug in Bruges. Their role is to keep fishing vessels away from the cable. On scene with winds gusting to over 50 knots North East the 14- metre all-weather RNLI boat Esme Anderson managed to throw a heaving line to the 20- metre casualty, who was then able to pull the tow line across. Once attached, the crew started the long slow tow back to Ramsgate but this was not without adventures. After approximately three hours of towing, the tow line chaffed, then snapped and was lost at the casualty end. The lifeboat crew then pulled all the 160 metres tow line back in by hand, in the dark with strong winds, large wave heights, extreme swell and pouring rain. The crew were forced to on to their knees to do any manoeuvres, and made ready for a second attempt. The casualty vessel still had the heaving line onboard so they reversed the earlier operation by throwing it to the all-weather lifeboat, allowing them to re-attach the tow rope, which was again pulled onboard by the casualty crew. Once re-attached to the casualty the RNLI Esme Anderson was then able to continue the tow safely into Ramsgate harbour arriving shortly after midnight. An RNLI representative managed to speak with the skipper of the guard vessel and he expressed his gratitude to the volunteer RNLI crew who are prepared to go out in all weather. All three of the crew were under no illusions that this was a dangerous situation to be in and were delighted to see the lights of the all-weather boat coming through the night. 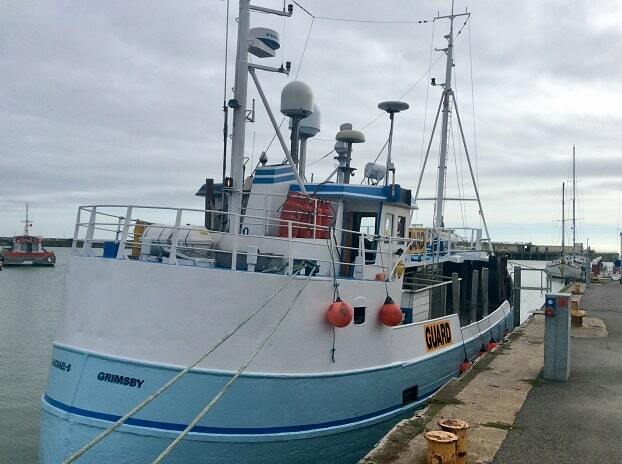 The engineer is currently working on the boat and they hope to be able to return to sea shortly.